Most likely a reference to peyote, a small, spineless cactus that contains, among other compounds, mescaline, a psychoactive alkaloid that can alter one's perception and induce hallucinations. 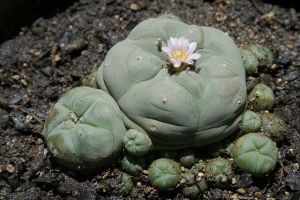 Peyote has been significant in many Native American medicinal and spiritual practices. It is still taken as a ritual sacrament by followers of the Native American Church ceremonies. Although it can be found and harvested as far north as the Chihuahuan desert, in southern Texas and northern Mexico, it is unlikely that individuals would be able to find peyote as far north and west as the Zuni reservation in New Mexico and Arizona. "Flower of the peyote, January 28, 2010" by Daniel Fuentes is licensed under CC BY-NC-SA.